Based on a poem of the same title by Coventry Patmore which appeared in his first volume of poems published in 1844. It refers to a relationship between Maud, the daughter of a woodman called Gerald and the son of the local Squire that comes to nothing because of their difference in rank. Maud bears a child which she drowns in a pond and goes mad. The painting was done both outdoors and in his studio. The model's names are unknown. The girls gface looks a bit hazy, this is because it was repainred by Millais in 1866 after some criticism. 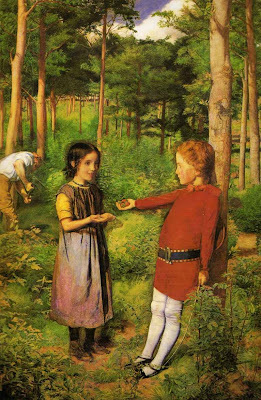 John Everett Millais - ?